AAAHHH - holiday baking. My mum only did 2 or 3 recipes every season, but as a good woman raised in the mid-west, there were occasions all year when a homemade treat was in order. After leaving home at the age of 17, home baked goods became a real treat. It was all I could do to make something to eat every night. Who wanted to spend more time in the kitchen making dessert? I picked up the torch when my kids were small. Money was tight and time limited with 3 toddlers underfoot, so I started in October baking goodies and then freezing them in Tupperware containers. By mid-November I had a pretty impressive stash. During the 5 weeks leading up to Xmas I would pull out one of each type of treat to create a gift plate that was wrapped in holiday cellophane and topped with a bow. These proved great thank-you gifts for those we wanted to honour (such as special friends or my husband's boss) as well as hostess gifts for the parties we attended. The only negative that arose was with my oldest son. He was probably around grade 1 when I started and seemed to be upset and grumpy for weeks on end. First we thought he just naturally hated Christmas. Then we finally realized having all the baking go in the freezer and disappear upset him. He felt left out. 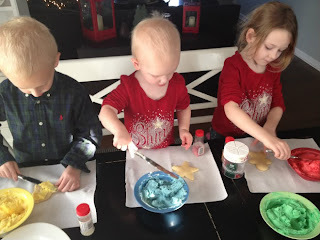 So he and I made a batch of sugar cookie, decorated them with sprinkles and put a few in his room - his own private stash of goodies that he had control over. Problem solved. Not my kids - but you get the idea! 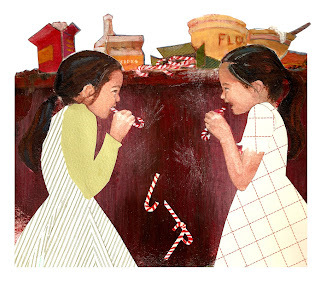 As my life became busier, somehow the time slipped by too quickly with school, kids acitivities and, etc., and this tradition vanished only to reappear a few year later in a new format. My daughter really wanted to learn to bake. As my mother was up for 2 weeks every Christmas, I bought some cookie/bar recipe magazines, purchased the supplies and let this be bonding time for grandma and granddaughter. They would pick 2 or 3 recipes to try and we would all pig out on the final product. When the kids were young, one batch was always sugar cookies cut into holiday shapes. Then there would be a family night with all the kids that included several colours of frosting and 3-4 kinds of sprinkles. It was a huge mess with icing, sticky fingerprints and sprinkles everywhere, but totally fun. When my mother passed away in 2009, our holiday time again changed. A few years ago my grown daughter picked up the torch, but mainly as way to give gifts to her friends during the holidays. As she was the only one baking in the house, we all considered ourselves fortunate she made extras for us. This year I felt it was time to get back on the horse. My kids are now all adults and my daughter is talking of moving away in March. How many holidays will we all be together - who knows? So it was time to heat up the oven and let the traditional baking season arise yet again in a new reincarnation - kamikaze baking. Where I no longer run a magazine I personally have a lot more free time, but my daughter has a new job with a VERY busy schedule. As it was already the 2nd week of December, we decided to have a kamikaze baking session spread over a few days. She wanted to try all new things, I wanted to honour the past as well. So I brought back 4 old recipes I used to make when she was very small as a nod to tradition and then we selected several new ones to try - a nod to creating traditions. The recipes will be split into 2 articles - the first called Something Old where I cover those I am bringing back and the second call Something New that will include those we tried for the first time. 1. Have lots of pans - all with nonstick coating - so you don't have to constantly stop production to wash everything. I would suggest two 9" x 13" inch non-stick baking pans and 4 regular size non-stick cookie sheets. One recipe of bars will fill one pan and one recipe of cookies will usually take 2 cookie sheets. You will also want several cooling racks. 2. Same goes for bowls, measuring cups and utensils. 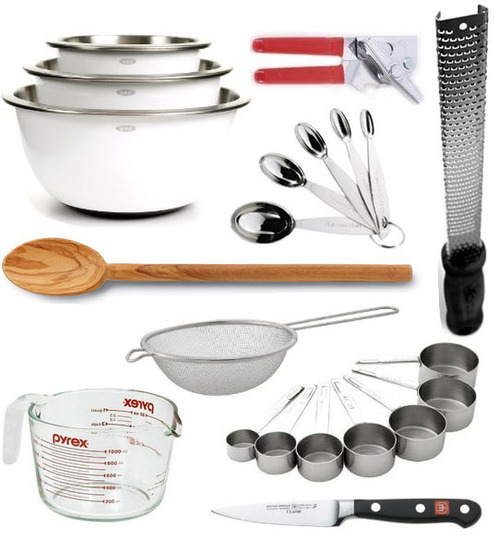 I have 3 mixing bowls, 2 heavy duty wooden spoons that take a lot of pressure, a set of measuring spoons, a set of individual measuring cups (1/4 C to 1 C) and then 2 extra multi-size measuring cups that have markings for 1/4 c to 2 C. I am going to add a 4 C measure next year just for flour. I only have one scraper and spatula, but that seems to work for me. I just don't want to have to wash measuring cups and bowls between each recipe. So having several is a blessing. 3. Other - aluminum foil, parchment paper and wax paper are good to have on hand. I sometimes line pans with foil or parchment when making bars as I can get them out in one piece and put them on a cutting board to slice. Lining a cookie sheet with parchment paper also keep it clean for the next batch. The only worry is if your cookie sheet has no sides as the paper can slide off dumping the cookies on the floor. 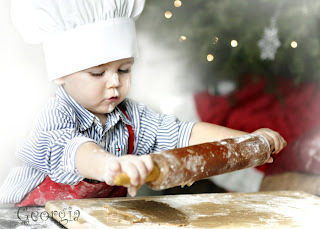 Parchment is also good if you have any ingredients in the cookies such as crushed candy canes which can stick to the tray. 4. Place the cooling racks on a layer of old newspapers so that you can just wrap up any crumbs and toss the wad away. Anything you can do to keep clean-up simpler when you're power baking is a good idea. 5. I bake with margarine as you can buy large 3 LB boxes in the grocery store. It contains 12 individually wrapped squares or sticks and each is equal to 1/2 cup. As most recipes use 1/2 C or 1 C (1 stick or 2 sticks) this saves you having to measure this ingredient and it's less messy. They are usually on sale this time of year, too. I picked up a couple boxes when they were buy one get one free!! Set them out a few hours ahead of time on the counter to soften. 6. Have lots of large Tupperware type containers ready. I freeze it all and then just pull out of few of each when I need them. I prefer the flat, wider ones. When they're deep you have to layer too many types of cookies on top of each other. My favourite is the one by Rubbermaid below. It's larger that it looks - 1.5 Gallon capacity and 16.5" x 11.5" x 3.5". At most you will have 2 or 3 layers depending on how high the cookies are. This year I purchased a few more for a total of 5 and they are all full, plus some extra smaller versions I had lying around. 7. Large Ziploc bags are also a great idea - the Freezer Bags are strongest. I mix up at least 3 recipes one after the other, placing each when done in a Ziploc bag, squeezing the air out and then refrigerating. They actually can be left overnight. This worked great as I could get started while Danielle was on her way home from work. then when she arrived home, she could decide whether to start baking a batch that was ready or mix up a new on she wanted to try. 8. You will notice a difference between baking dough that has been refrigerated and dough that is room temperature. First I would always refrigerate it if it says to in the instructions. If it doesn't, then you need to be aware a few things. When room temperature, the cookie dough will tend to spread out more while baking and take less time in the oven. If the dough has been chilled, it will tend to stay in a more compact, taller mound and take a little longer time to bake. 9. Melting chocolate or baking chips (such as butterscotch, toffee or peanut butter) - The safest way I have ever found is over water. I know there are microwave recipes, but I find over hot water the safest and most reliable. You can use a double broiler, but I jury rig one. Take a small sauce pan, fill half way with water. Place a heat proof bowl on top. It's best if the bottom curves into the pan a bit. 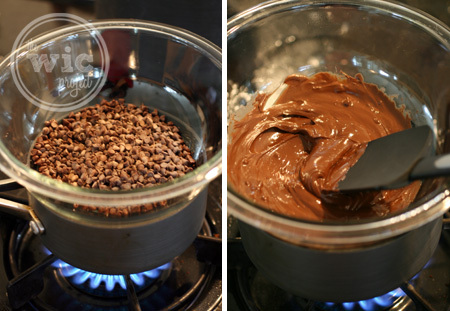 Turn the burner on medium and let the water simmer while the chocolate slowly melts. Stir occasionally to keep it melting evenly. The pan is not dirty so just pour out the water and wipe dry. The bowl can be popped in the dishwasher for easy clean-up. 10. The recipes that smelled best this year were those with grated lemon or orange zest. I have tried several ways to make zest, but for baking in particular I have come to appreciate the small mini-grater. This is not the super small one for hard cheese, but the smallest one for regular cheese. It gets just the outer rind which has the most flavour/colour and avoids the white flesh. It also makes super fine zest which works better in cookies. Because of this, it takes a lot of lemons and oranges to get enough rind, but it's worth it. One tablespoon takes 2 decent size lemons or 1 large orange. The grater below left is similar to the one I use. The top half is the standard grater. The smaller bottom half is what I use. Remember to wash your fruit first and cut off any printed branding on the rind. 11. Think SMALL for holiday baking. Ignore what they say and go smaller as you want lots of one or two bite pieces. This is particularly true of cutting up 9 x 13 pans of bars. I cut them 6 crosswise and 5 lengthwise. This gives you 30 small bites of bars. When you have a plate of treats you don't need a large piece of any one kind. 12. When is a cookie done? In my opinion when the underside is a light brown. You don't want it too dark unless you prefer a crisper, dryer cookie. Really light and you get a doughier cookie. But a very light brown is right in the middle. Trying to judge this from the top of the cookie is really difficult. Bars are also a little harder and when they are layered, you usually have to trust the recipe. 13. One interesting note - old cookie recipes used to have you bake at 350 degrees for 12-15 minutes. Now all cookie recipes bake at 375 degrees for 8-10 minutes. Remember all ovens vary, so be sure to check at the earliest time until you get a feel for your own oven. 14. To wrap them this year I bought 9 inch holiday paper plates and a package of 6 Cookie Tray Bags. 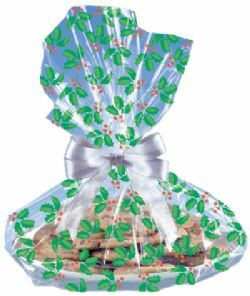 They are clear cellophane printed with holiday designs - mine have holly leaves. They also have colour coordinated twist ties. You set the plate in the bottom, add the cookies, twist the top closed and then if you like you can add a bow. Both I found at the dollar store and were really inexpensive. 15. Understand the measurement abbreviations! That's all I can think of now. I'm sure a few more will come to mind. Check back in a few days for my Something Old recipes. And feel free to comment with some of your own favourites if you feel inclined.